Sharing is caring The Renault Alaskan is yet another take on the Nissan Navara, and the Fiat Fullback is a rebadged Mitsubishi L200. £46,020 How much Mercedes now charges on-the-road for the more powerful X350 in this car’s equipment spec. 5.3m - Average length of a double-cab pick up. At 5362mm, the Ranger is longest. At 5205mm, the L200 is shortest. This is not a ‘proper’ group test for these vehicles. Because it’s a group test of commercial vehicles, not cars, and, as a man who sold vans once told me, there is a big difference between the two. With cars, you’re dealing with people’s own money and therefore their own emotions. With vans, you’re freed from the constraints of either: it is a transaction and a decision and a discussion based on absolutes that, for the most part, start with statistics to meet needs and end with a pound symbol. And that’s that. So it ought to be, then, with these five double-cab pick-up trucks. They’re so similar in layout and intent and capability that to decide which is best – to do a ‘group test’ properly – for your commercialfleet, you should probably do nothing more than sit down with a spreadsheet. This, then, isn’t such a test. (I believe some are available.) 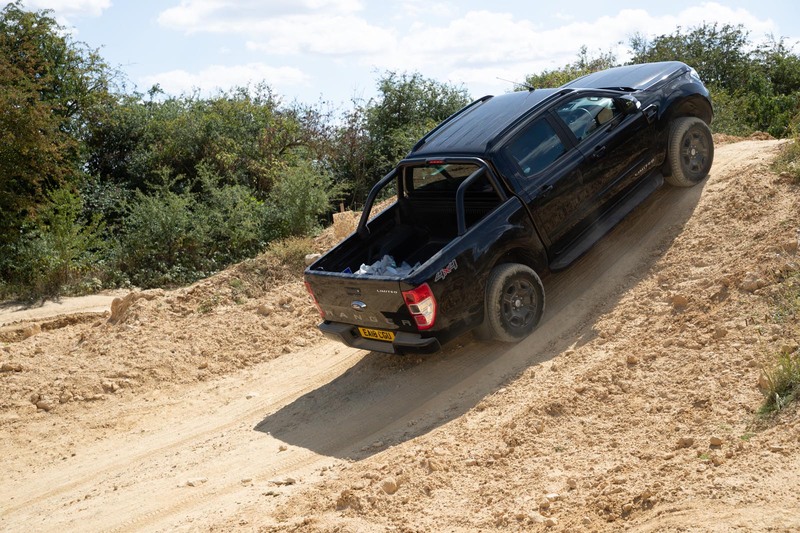 This gathering of pick-ups in a disused quarry in the east of England is – perhaps inappropriately, but we’ll run with it – similar to one of our enthusiast-oriented tests instead. Sure, we’ll look at the numbers, but we’ll also drive around a bit and decide which one we like sitting in and driving the most. A large objective element, then, but with a bit of what I’d call subjectivity and others might call blind prejudice thrown in. After all, it’s what an individual small-business owner - running one of these on the company because it can carry over a tonne, and therefore the benefit-in-kind tax is about the same as for a basic hatchback – would do. They’d decide which is best for the money, but also which is best suited to weekend pony club or kart track events. It’s more likely to be left overnight on the drive than in the work yard. The new Mercedes-Benz X-Class was designed specifically for these kinds of users. And the arrival of the X-Class is why we’re here with its rivals. Mercedes doesn’t have form with pick-up trucks – Unimog aside – so underneath, by and large, the X-Class is the same as the Nissan Navara (which is why we didn’t bring one of those along too), albeit with a better badge on the nose and a better interior. In the best double-cab tradition, it has a separate body and chassis, although, uniquely in this company, it has coil springs and what Mercedes is inclined to call multi-link, rather than a set of leaf springs, but it still locates a solid rear axle. It comes to us in X250d specification with a 187bhp 2.3-litre engine and automatic gearbox. I’ve driven it to our quarry, with 250kg of ballast in the back, and I’ve taken the others, laden similarly, on a road route too. But for the purposes of the photo shoot (and a video you’ll find online soon), we’ve opted to show them at their ruddy, muddy best. The X’s closest competitor in ethos is, I think, the Volkswagen Amarok, particularly now that the VW comes with a V6 engine, rather than a 2.0-litre four-cylinder diesel, which VW had been asking quitea lot of in a vehicle of this size, to the extent that it was fudging the answers it was giving. It can be had with 258bhp, but in this 161bhp V6 base form, it’s manual gearbox only, and therefore the only manual here. The others have the same layout: a four-cylinder diesel with an auto ’box. The Mitsubishi L200, here in 2.4 diesel 179bhp Warrior specification, was probably the first double-cab pick-up to establish itself as a ‘lifestyle’ alternative – bought and used as a family vehicle at weekends. There used to be a campaign against ‘urban 4x4s’, before everybody had one, but pick-ups managed to evade the contempt, even as the L200 helped double-cabs become if not urban 4x4s then definitely suburban ones, what with their upmarket specifications, chunky chromed components and that low benefit-in-kind tax rating. 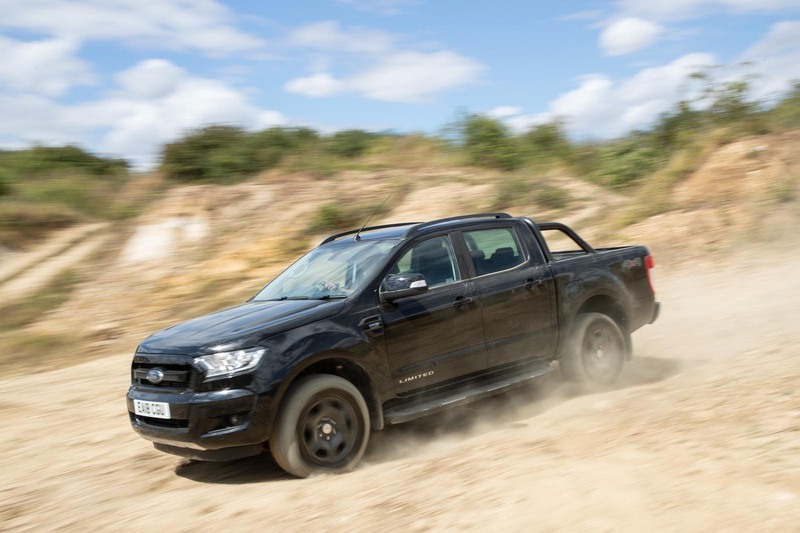 The Ford Ranger, in relatively upmarket Limited specification, follows the path. Here it has a 158bhp 2.2-litre engine. And then there’s the most ubiquitous pick-up of all, the car known across all continents, used in situations so diverse that some might be used to deliver aid while other models not very far away from them are dispatching .50-calibre shells at high velocity. It’s the Toyota Hilux, and if anybody can use the specification ‘Invincible’, it’s probably Toyota. But Warrior, Invincible, Wildtrak, Barbarian... there’s a theme with these trucks: all names that suggest you can do what you want with them. There are, though, given they are commercial vehicles, absolutes too. One of which I’m going to go into less here are prices, because you can usually have different trim levels, we aren’t always able to test like for like and what you negotiate and end up paying out monthly is definitely a spreadsheet activity. But they’re around £32,500-£36,500 (the VW cheaper, but not if you get an auto, which requires going one model up the range). All can tow 3500kg apart from the VW (this base model 3000kg, other variants 3100kg) and all can put between 1045kg (L200) and 1120kg (Hilux) in the back. The Toyota also has a wide rear gun platform/load bed, but not as much space between the wheel arches as the Amarok. Why are they all capable of holding a tonne and a bit? Hard-tops are given a nominal weight of 45kg so these trucks all qualify as one-tonne pick-ups for tax purposes even with those fitted. All, though, drive better on the road if you put at least some load into their rear beds. So that’s one thing you should know, subjectively, about them: you’re getting a calmer-riding vehicle if you use it as a workhorse. Rugged is one thing they are. We drove around this very quarry last year for a Land Rover Discovery off-roader group test and it’s reassuring that each and every one of these trucks is a more serious vehicle in these conditions than any of those 4x4s, Jeep Wrangler aside. The Jeep was the only one as comfortable rock crawling, on moguls. That also means you can make excuses for the fact that none of the pick-ups, inside, is particularly special. But even by these standards, there are differences. Worst is the L200, which has a curious high-set and yet low-roofed driving position, so it’s strangely cramped, and which features a distinctly average set of interior materials. Next up is the Ranger, which has a better driving position and a reassuringly practical layout and some good infotainment functionality, but it still feels pretty un-special inside. The other three feel a shade above – if still not as nice as, say, a typical family hatchback – inside. The Toyota is the blandest and most ordinary of the top three, but logically laid out. Nothing shouts ‘Toyota’, but nothing does on any Toyota. It leaves consistency of fit and feel to the Germans. The VW feels like a Golf from about a decade and a half ago, in that there’s a clarity and consistency to its controls, and some respectable finishes on upper surfaces. But even it probably gets shaded by the X-Class, to an extent. There are interesting-looking air vents, and a rudimentary version of Mercedes’ Comand system, matched to some big slabs of shiny plastic pretending to look like metal. They don’t totally succeed, but at least they’re having a go. If you want the most car-like interior experience, the X-Class and Amarok are your cabins of choice. Does this trend continue in the way the five of them drive? A little. Each of the five gets a low-ratio transfer case and differential but the L200 is, I think, the most agricultural-feeling car of them all. Its steering is slow and vague – with more turns one way than another off centre, oddly – and yet it’s also the one that struggled most with the first of three specific tests we set up for these cars. Imagining we’d just pulled directly off of a highway into a work environment with some mild moguls to traverse, the Mitsubishi’s electronics struggled with a spinning wheel more than any of the others. You can change the settings to work around it, but in the others, we didn’t have to. The Ford, meanwhile, has a much more reassuring sense about its controls. It steers pleasingly and the engine is quite muted – quieter than the Mitsubishi’s, anyway. It also rides more pleasantly, in that Fordy way where the steering weights up nicely and the controls all have the ‘right’ sort of weight, to the extent that, as Ford’s passenger cars do, it presents a definitive reason to buy one over something else. Is that reason enough to choose it over the Mercedes? I dunno. I suspect that even if you’re reading a group test in a magazine that cares about ride and handling, improved steering response might not be enough to convince you that a Ranger is preferable to an X-Class, but one of these two has to fall next. 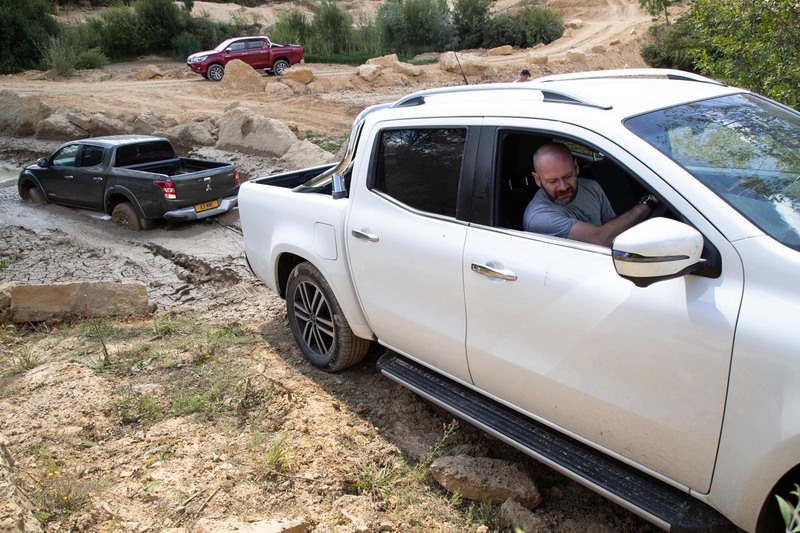 Over an L200, both the X-Class and the Ranger are more refined, better to drive and better inside, but the X-Class’s fit and finish probably edge it in front of the Ranger. But then the X250’s engine sounds louder to me than the Ford’s and its mildly fancier rear suspension doesn’t seem to give it any particular ride advantage to my backside, either. And the Ford is cheaper, especially now this test car’s Power trim level is only available with a V6 engine. I’d go for the Ranger, but my advice is to let your particular spreadsheet and which you’d rather see on the drive decide which of these two comes third. I’m comfortable, though, that there is a top two, even if the Toyota comes with a 148bhp engine whose torque output starts with a two rather than a three. I think it and the VW, though, both have quieter engines than the Mercedes and, more crucially, both have more refined and comfortable chassis – the VW particularly so. Which is the better, overall, of these two is harder to call, and – typically – it depends how you use them. The VW is the nicer-feeling truck inside, with an interior feel that puts a reassuring VW arm around your shoulder and reminds you that everything is cosy. Plus its V6 engine is smoother, if thirstier. It’s the more car-like of the two. But these aren’t cars, and while the Amarok’s extra width (1954mm versus 1855mm) means its cabin is more spacious and it has more space between its deck’s wheel arches, the Hilux feels more manoeuvrable, itis easier to place on narrow country lanes between fields, it wants less fuel and it can pull more. Both are fine vehicles. The VW has more emotional appeal, but the Toyota feels more pragmatic and, for that reason, gets the nod. Maybe this is a proper group test, after all. 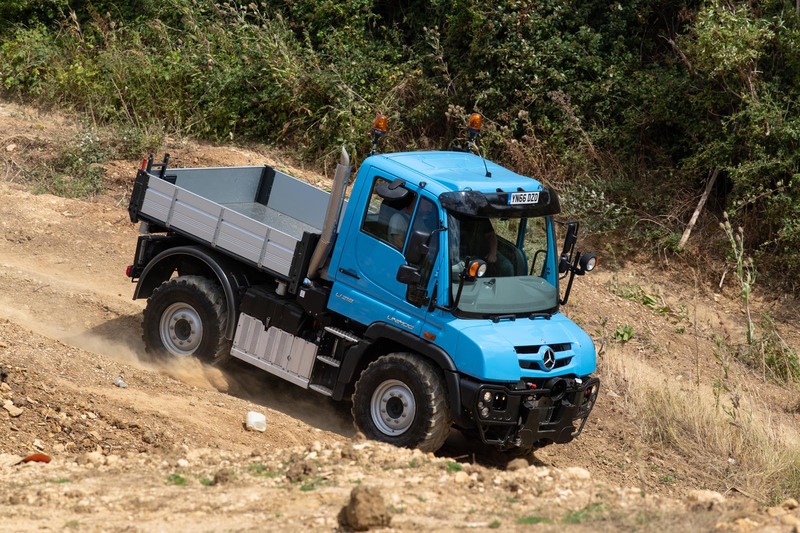 Let’s not pretend Mercedes doesn’t know how to do a pick-up when it wants to: this is the £100,000 or thereabouts ‘baby’ version of the Unimog family, the U218 Implement Carrier. Which we’d brought along for the giggle of it. Like other vehicles here, the engine is a four-cylinder diesel, and it makes 175bhp, which is in the ballpark of other vehicles here too. The difference is that it’s 5.1 litres in size and happens to put out 553lb ft of torque at an engine speed at which the others would barely idle. The maximum power is all done by 1600rpm. All in, in this form with a tipping back, this ’Mog weighs around 10 tonnes. But you don’t have to have the tipper – the clue is in the name. The ’Mog can be fitted with snowploughs, tree or hedge cutting tools, lifts, pressure hoses – basically anything you want from its hydraulic, electric or transmission-drive attachments. There is no other working vehicle quite so versatile: it’s halfway between a light truck and a fast tractor. The Belgian army recently commissioned a UK contractor to make 200 of them into gun platforms. It’s great fun to drive. Slow, yes, but with a wicked turning circle, spongy seats and a (relatively) refined transmission – with eight forward and six reverse gears. 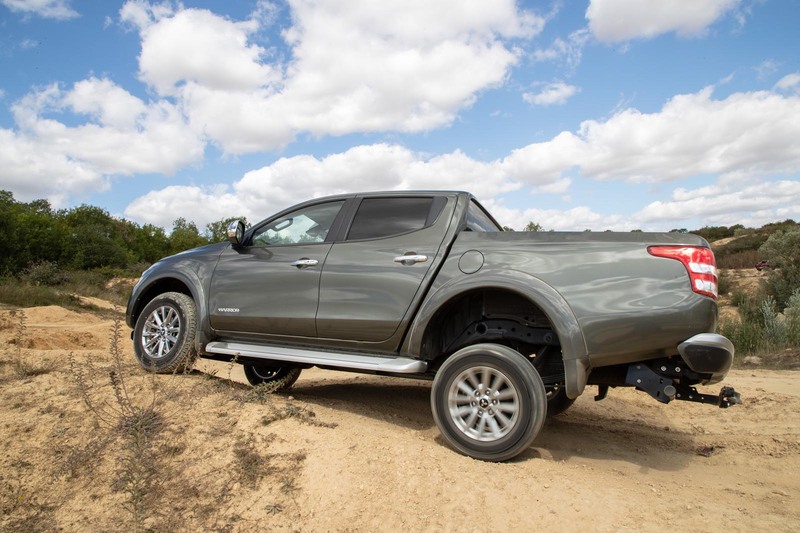 The wheelbase is 2800mm and ground clearance – because there are portal gears so the axles sit above the wheel hub – 347mm. It’ll do 56mph, climb a 1:1 gradient – but not at the same time – and while it does that, yes, it feels slightly precarious. But it is still the most fun any of our testers have had this year. I really like your article. I had much useful stuff from this article. i really appreciate your efforts Hostgator coupon for write this post. Thanks for sharing that informative post with us. As a pick-up owner, I'm so pleased Matt didn't fall into the trap of judging them as cars. They are, thank goodness, not like any current cars. Whilst I use mine most days for some sort of farm duty, it was bought in large part to get away from the dreary place cars have moved to. I am sick to death of reading about the fit and finish of car interiors. In this case, the beauty is in the durability and functionality and nowhere else. And it is beauty. 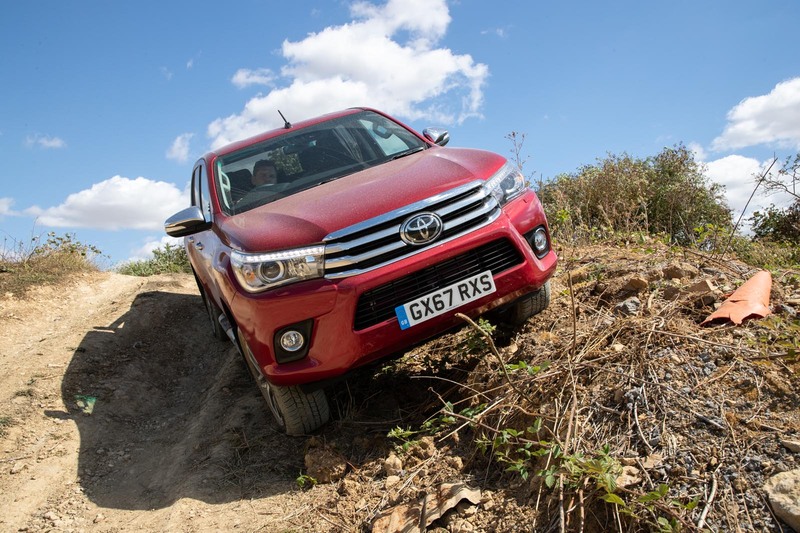 I still haven't tried the latest Hilux as I don't do as much field / site work these days. But I'm hoping to get out of the office in the next few months, and I'll be requesting a Hilux without hesitation (assuming the client won't want to pay for a Land Cruiser!). The last model felt truly invincible, which I guess is why Toyota chose that moniker. Even in the hottest driest dustiest conditions imaginable they've never let me down. Not the most refined things by any stretch of the imagination, but the rock solid engineering integrity always shone through - built to a standard, not a price. Oh, and I want a baby Unimog! Why did you put the base spec Amarok up against the best the others could muster? Shouldve used the 258bhp V6 model with 8sp Auto, just to show how far behind all the others really are. 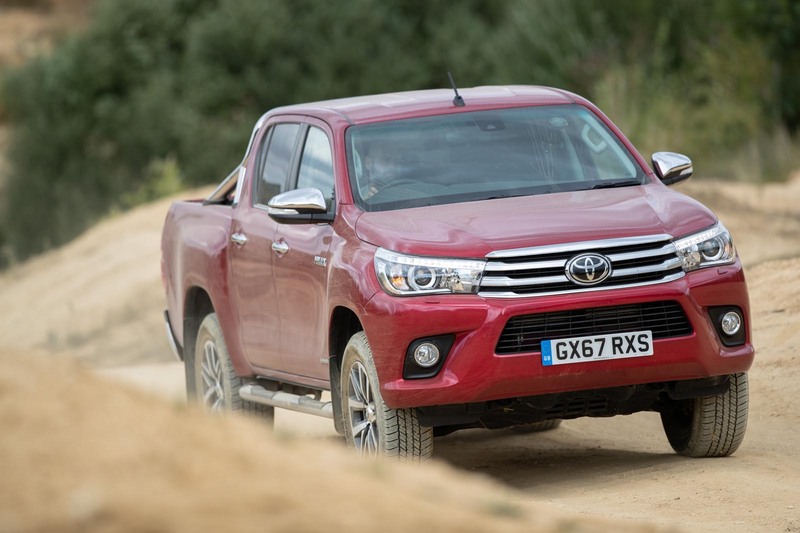 "But these aren’t cars, and while the Amarok’s extra width (1954mm versus 1855mm) means its cabin is more spacious and it has more space between its deck’s wheel arches, the Hilux feels more manoeuvrable, itis easier to place on narrow country lanes between fields, it wants less fuel and it can pull more"
Don't get it, why is Merc trying to become all thing to everyone.. now waiting for BMW and Audi to get into this market for pickups..might as well... you'd be a fool or with more money than sense to get a Merc pickup rather than one from less premium brand.. aren't pickups just work horses.? ...should have been included just to embarrass the daft MB. Exactly, I am dumfouded. The Navara is one of the best selling 1 ton pick ups in the UK never mind the world, has been for decades. Would have been a caveat I presume sent to Autocar by Merc. DON'T test the Navara up against it.